Pure August. The abundance of tomatoes, corn and peppers is upon us, despite the terrible tomato-growing season. This simple soup has a tomato and red pepper base seasoned with chili powder and cumin. The red pepper gives the tomatoes an instant density and mellowness that would be achieved only after hours of cooking the tomatoes alone. Green bell and jalapeno peppers are sautéed until tender and stewed with freshly cut corn, and then added to the base. This is reminiscent of cold season vegetable chili, perfect as our nights turn cool, but it has the lightness that we appreciate in summer fare. 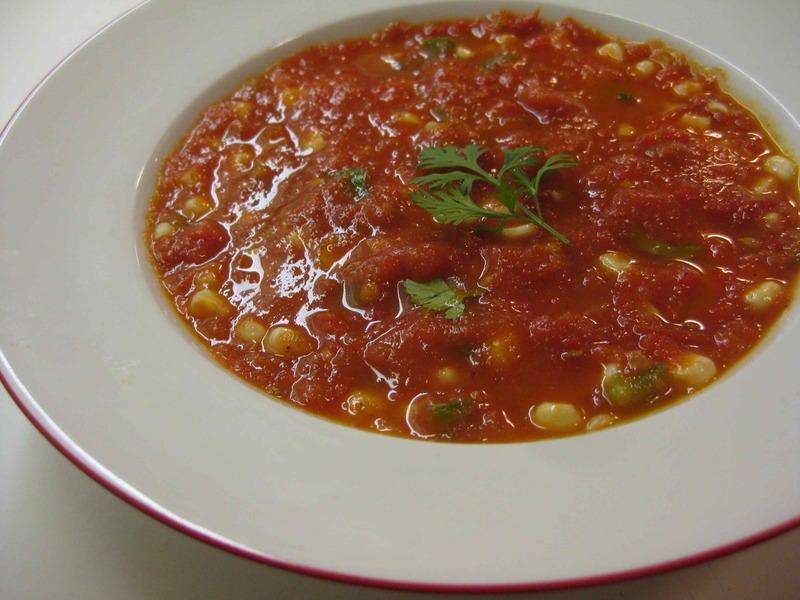 If you wanted to serve this as a vegetable chili, simply boost the spices and increase the proportion of corn and peppers to tomato. Heat the oil in a large saucepan over medium heat. Add the red pepper and onion and sauté until soft. Add the cumin and chili powder and cook for a few minutes. Add the tomatoes and salt and increase the temperature to bring the tomatoes to a boil. Lower the temperature, cover the pot and cook the tomatoes until they have reduced to a liquidy puree and are cooked through, Add water if the tomatoes are not thin enough for soup. Meanwhile, sauté the green pepper, jalapeño and corn in a little olive oil until they are crisp-tender. Garnish with additional cilantro leaves.